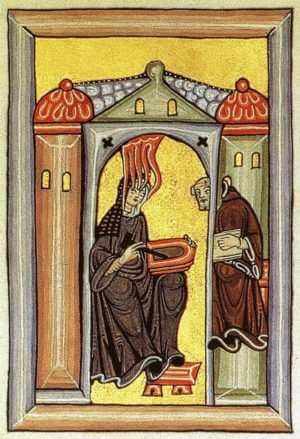 Hildegard of Bingen (c1098-1179) could be described as a Renaissance Woman long before that term was coined (for men) or the Renaissance dawned. She was a poet, musician, theologian, composer, artist, doctor, botanist, philosopher, environmentalist, singer, herbalist, preacher, lexicographer and visionary – and it would be no idle claim to call her an early feminist. Hildegard was born in Rhineland and given to the Church when she was 8 years old. As an adult she became mother superior of her order at St Disibod, but having come into conflict with church authorities, she founded a new abbey at Rupertsberg near Bingen in 1150, taking many of her nuns with her. Although sometimes controversial and not above bitter arguments with clergy, she was enormously respected in her lifetime and, as well as preaching widely in Europe, she regularly corresponded with a number of popes. Her beautiful, ethereal music has grown in popularity in recent years, as well as some of her mystical art, which was inspired by her visions and set out in her major prose works: Scivias, Liber Vitae Meritorum and Liber Divinorum Operum. She also practised medical and herbalist sciences, transcribed her own music and invented her own script. Her medical knowledge was extensive, and although some of her prescriptions sound strange to modern ears, she is credited with having effected many cures. This poem was written for a book about Hildegard, published in Italy in 2012 on the occasion of Pope Benedict XVI naming Hildegard a Doctor of the Church*. It also formed part of an exhibition of my poetry mounted in Winchester Cathedral when I was Poet in Residence for that city’s Ten Day Arts Festival in 2013. The poems were set in appropriate places all around the cathedral, and because of its subject matter, this one was placed below the pulpit. through all that’s green and good, in all that grows. and if they could, they wouldn’t understand. could be grounded in a woman’s native wit. * Hildegard, Visions & Inspiration, edited by Gabriel Griffin, published by Wyvern Works, Italy, 2012. 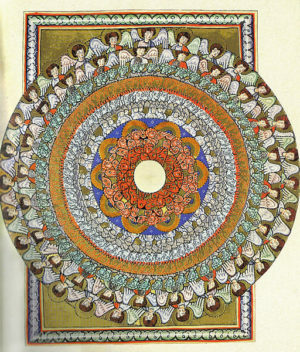 Vision of the angelic hierarchy from Scivias 1.6.